Last week I took a first look at Tweetie for Mac, a Twitter client from atebits that shares a name with its slightly older, but still-just-as-hot iPhone cousin. 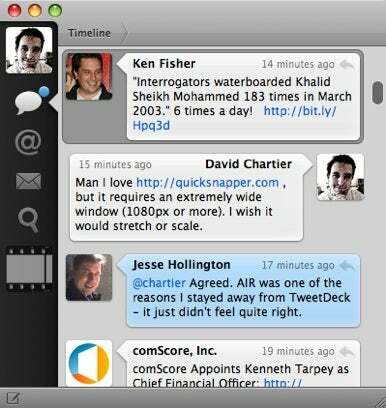 Today, Tweetie for Mac 1.0 has been released to the public in both free and paid versions. For a short refresher, Tweetie is a fairly full-featured Twitter app that sits quite well between long-time incumbent Twitterrific and the everything-plus-a-kitchen-sink challengers like TweetDeck and Seesmic Desktop. Tweetie features a unique UI with separate sections for your friends’ timeline, replies and mentions, direct messages, and a search panel that can be torn off into a separate window. You can easily dig through conversation chains by double-clicking tweets, and clicking users’ icons will display their profile with things like recent tweets and follower/following stats. There is a keyboard shortcut for almost everything, and you can even close the main window to avoid being distracted by your friends while still tweeting with the separate compose window. Multi-account support is also present, making Tweetie a great choice for those with multiple personalities, a spoof account or two, or a business identity to run. I beta tested Tweetie for a couple weeks, and it is my new default Twitter client. Tweetie is fast and provides a fun amount of UI polish and flair, offering a lot of productive Twitter power so I can tweet and get back to what I should be doing (yes, I just said “Twitter” and “productive” in the same sentence). Tweetie requires Mac OS X 10.5 Leopard, and you can download a free, full-functional, ad-supported copy of Tweetie for Mac now. A license that gets rid of the ads costs $14.95 through May 4, after which the price increases to $19.95.